ASAP Ferg is a monster rapper, but apparently doesn’t know what forthcoming means. 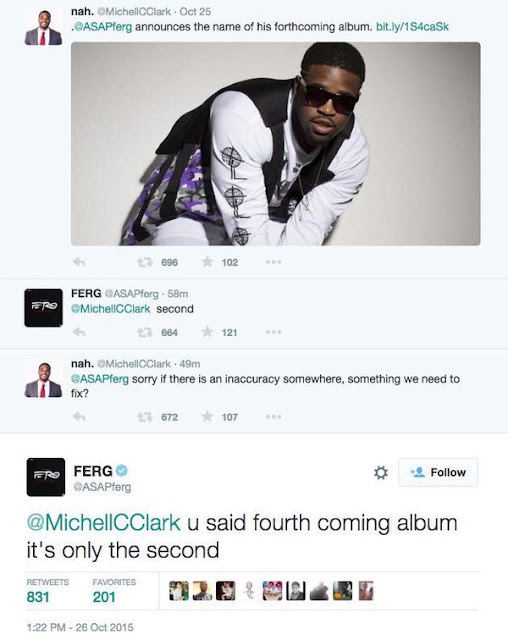 Ferg was either reading to fast, or really slipped up during this back and forth on Twitter. It’s all good, it happens to the best of us, but seriously Ferg has a new album coming, and while on the black carpet at the Tidal X: 10/20 concert, he revealed the album’s title, "Always Strive and Prosper," which is what ASAP stands for. “It’s my rags to riches story for those who don’t know where I come from or how I got signed or my story, you’ll find out on this album,” he told Hot 97. Make sure you go out and support the Trap Lord.